Chariot Race - Icebreakers, Icebreaker Ideas, Games, Activities! “Chariot Race” is an exciting race on “chariots” to the finish line. It’s a game about being a little ridiculous with your friends. The game is best done at a party or with a large sized group. This game is for developing team building skills and will bring the players closer together after the successful completion of a few rounds. You may have to collaborate with your group to acquire enough materials to play the game, but we promise the reward will be worth it! For this game, you need sufficient wheelbarrows or sleds. Make a note counting the number of people who are coming and divide them into teams of 3 to 4 people (not including the player in the chariot). Once divided search out a safe place where multiple wheelbarrows could fit and use your chalk to draw a finish line. Next mark measures out to the best of your ability a fair distance where each played will be waiting to swap the chariot, mark these locations with an X. For optional set-up, you can make the event toga themed, and use sheets to recreate a toga for each player. You may wish to to secure all togas with a clamp or safety pin to avoid in-game accidents. How To Play “Chariot Switch"
To play “Chariot Switch” you need to distribute the teams and make sure everyone if familiar with one another. Afterward, divide the team up to stand on the markers along the way to the finish and let them select a player to put into the chariot. Make it clear that they have to use their hand to tag out by high-fiving the other player before the chariot can be switched over. If togas are involved do a tug check to make sure all players are secured for the game. For added difficulty, you can make the paths less straight forward and draw arrows to make a winding path. If this happens make sure the paths you draw each have their own separate colors to ensure no one loses their way into another team’s lane. To have the best chance of winning in this game you can use quite a few different strategies to your advantage. When selecting the player to put in the wheelbarrow always go for the lightest teammate to increase your speed. When the player is the wheelbarrow have them balance out their weight or put it slightly more forward so that there is less resistance. When tagging your partner have them waiting with their hand already out so you can high five them and switch out quickly. If it turns out you have to use sleds try tieing the sled around your waist for easier pulling. Also, have the player sit directly in the middle of the sled so the weight will be evenly distributed. If your playing with a winding path pay close detail to the direction of the arrows to more quickly maneuver to the finish! 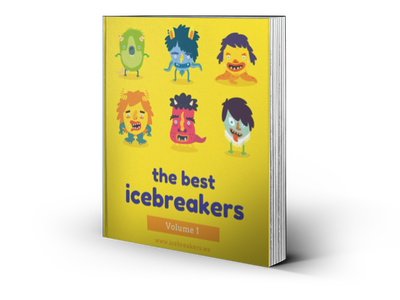 Electric Current Game - Icebreakers,Ideas, Games, Activities!